To celebrate our Christmas read for December’s Book Club, I am thrilled to share with you my recent Q&A with Rebecca Raisin. In addition to The Little Bookshop on the Seine, Rebecca is the author of a number of contemporary romance novels, including The Gingerbread Cafe series. For more information about the author, find her on her website, or connect with her on Twitter, Goodreads and Facebook. I’d also like to say a big thank you to fellow Book Club members Emily from The Geek Undergraduate and Jess from The Teacup Library, for your interview questions to Rebecca! 1.) We chose The Little Bookshop on the Seine because it seemed perfect to read on the run-up to Christmas. What can we expect from the book? 2.) The books in The Little Paris Collection series are all set in France’s beautiful capital – what is it that made you choose to write about the city? I’m a Francophile! I’ve always been drawn to Paris, and have been lucky enough to visit the city of love twice. There’s something so magical and romantic about the place from the cobblestoned streets, the architecture, the glorious food. You can be one person in a sea of people, the chatter of French accents drifting lazily over your head as you amble down an avenue looking for adventure, each day stumbling upon something new. It’s one of those places where you can reinvent yourself, or find yourself, and fall in love…I did with a little bookshop on the bank of the Seine! 3.) What first inspired you to become a writer? I’ve always been a voracious reader, and it was a dream of mine to ‘one day’ write a book. I thought I’ll just write one, and see what happens. But instead, I took some creative writing classes at night time, and was hooked! I started with short stories, and subbed them to writing competitions. I did well, getting chosen for anthologies, and it sparked a passion that had been dormant for years. After a few years I thought I could probably tackle longer work, and then I found my place at Carina UK (Harper Collins) and have been very happy there. 4.) Do you have any writing traditions when sitting down to start a new story? I’m turning into a plotter, my editor and I plot and really nut out the story together now to make sure we agree and to save time deleting scenes that are redundant. But before that I was a panster, and I did love the freedom of envisioning a character, and letting them drive the story. They still do that to a degree, even when I plot, things will veer off as the heroine steers me along. I always find the first few chapters flow very well, and then it gets harder after that! But I do like every stage of the process so that’s lucky I guess! 5.) Is there anything you want people to take away from reading your books? I hope they feel like they’ve made some new friends. It sounds completely batty but to me my characters become so real after I’ve spent months fleshing them out, and having one-way conversations with them, that I hope the reader feels as though they stepped into their lives for a while too. And that maybe I’ve (hopefully!) taken them on a journey, and they’ve found someone they relate to and learned something new about themselves too. 6.) Some of your books are available in both paperback form and as e-books. From your experiences, how would you compare the two publication routes? The Gingerbread Series is available to buy from The Book Depository. 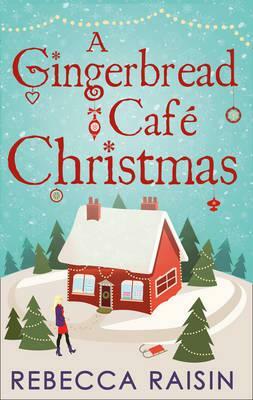 The paperback version of the Gingerbread series, A Gingerbread Café Christmas has just hit stores these last few weeks, so I’m not sure how that side of things is going as yet. It’s been a dream come true to have the girls (see, I am batty) from the Gingerbread Café in print, and to find their way into people’s homes this Christmas, because I know there’s still a lot of readers who only read paperback, so it’s wonderful to have that opportunity. However e-books are so quick and convenient, and the turnaround from finished manuscript to hitting the online stores is much quicker, so to have both routes is great. 7.) Fitting comfortably into the chick lit genre, your books tend to focus around love and relationships. Do you think there is anything that sets your books aside from other romance books on the market? Great question. I hope my books shine a light on love and the turmoil that it sometimes creates, and about the power of friendship, and having those people in your life that make you smile, or lift you up when you most need it. I hope they read more lifelike, and realistically, as though you’re reading a book about the girl up the road, and you can relate to her struggles, and her successes. I tend to get carried away with food, so there’s always a ‘foodie’ element to my books, or a book-ish element, because they’re my two favourite past times! 8.) Do you have any advice for budding writers? I was told once finish what you start, and I think that’s a great piece of advice. It’s almost too easy to give up when you get stuck, and begin another story, but what if you push past the hard part, and keep going? For me, there’s always a point in the story where it gets hard, and I cradle my head and moan, but I pull myself up and keep going, knowing that I can edit later, that if I type past the hard part it will become clearer again. 9.) Do you currently have any writing projects underway at the moment? I’m currently writing The Little Antique Shop under the Eiffel Tower and having so much fun with it. The main character Anouk is quirky and funny and utterly French, and Tristan the rouge American who turns up really pushes her buttons. They’ve got great chemistry and a range of issues they’re hiding from each other that’s making this story fast paced and a joy to write! Thank you so much to Rebecca for taking the time to answer our questions! The Little Bookshop on the Seine is available to buy as an eBook on Amazon.